Apparently pet birds and warships don’t mix. 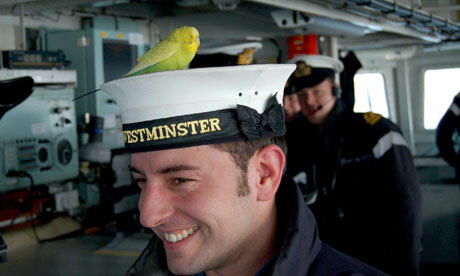 Sailors on the British frigate Westminster discovered a parakeet (also called a budgie) fluttering around the ship while underway for an exercise near Plymouth. They named the bird Bostie and fed their new friend a meal of nuts, bread and water. When a routine alarm sounded the budgerigar appeared to suffer a heart attack. Attempts to revive him failed and the crew gave their feathered friend a burial at sea. What exactly were these attempts to revive the bird? Did the sailors try some minuscular form of CPR? How did they perform this “burial at sea?” Did they wrap him in the Union Jack and gracefully slide the expired bird into the waves? Or did they just toss him in the English Channel? Did they perform due-diligence in researching best practices in parakeet care? Even a cursory Google search would reveal that budgies don’t like sudden loud noises. If only Bostie had found his way to the Irish Sea, where several U.S. warships are now conducting Exercise Joint Warrior 10-2 with the Brits. American sailors have a much better record caring for avian stowaways, as evidenced by the saga of Fod, the errant screech owl that found his way onto the carrier Harry S. Truman in 2008.